Do not conduct background checks until you have made a candidate a conditional offer of employment. All background checks should be reasonable to the needs of the job and done with the informed consent of the candidate. Education Background Checks are meant to confirm that your candidate’s educational qualifications are accurate. There are no specific legal restrictions prohibiting employers from confirming the accuracy of a candidate’s qualifications or transcripts with an educational institution. However, employers should exercise caution; contacting a school could reveal where a student was educated or what year they graduated: information from which age and country of origin might be inferred and the potential for discrimination arise from illegal interview questions. This type of background check involves confirming a candidate’s professional experience. Have they worked where they said they worked and for as long as they have claimed? This check does not involve questioning former employers about your candidate’s performance or personality. For that, you will need to consult your candidate’s employment references. Whereas with professional qualifications check you are merely confirming that the candidate has indeed worked at a place for a specified period of time, a reference check allows you to get a former boss’s take on your candidate’s competency, workplace productivity and behaviour. There aren’t any restrictions about contacting references at any point during the hiring process. However, it is advisable to have a standard set of questions to ask references of all candidates to avoid bias or discrimination. It is permissible to conduct credit checks and refuse employment based on their results. However, they are really only necessary for positions where the employee would have the opportunity to commit theft or fraud such as bank employees or accountants. Before conducting a credit check, written notice must be provided to the candidate. 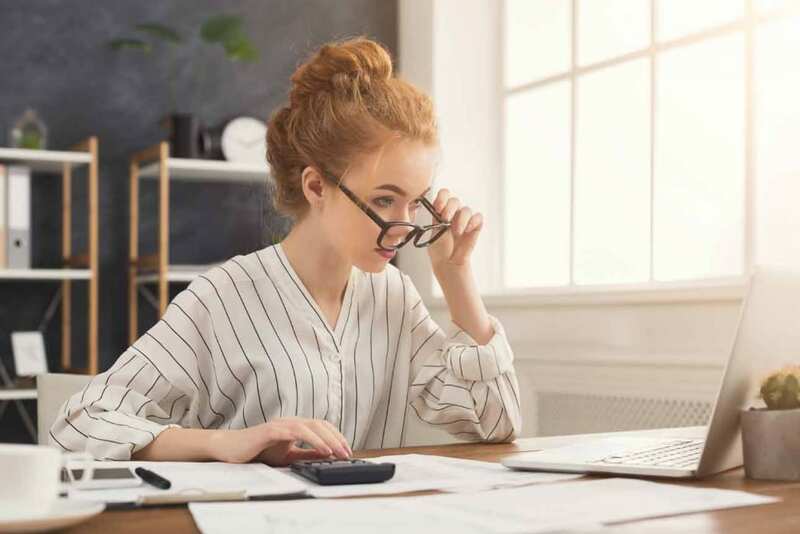 Because conducting a credit check requires information about the candidate’s age, it should not be performed until after a conditional offer of employment has been presented. This record check requires the person’s name, address and drivers license number and will bring up information about your candidate’s driving and license details. A driver record check is really only a bona fide occupational requirement for jobs like drivers, truckers and some sales positions. 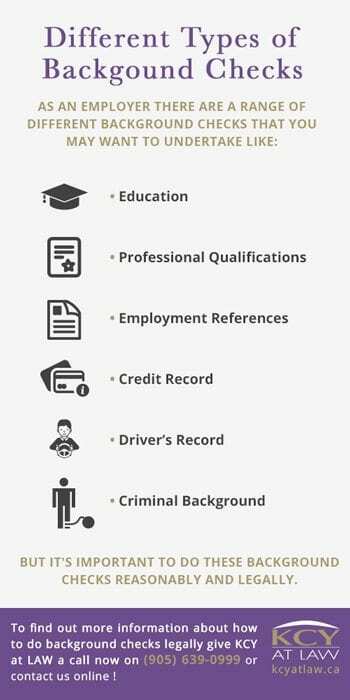 While you may think it would be nice to know if your job applicant has a criminal record, criminal background checks aren’t always necessary. In most cases, an employment check will suffice. 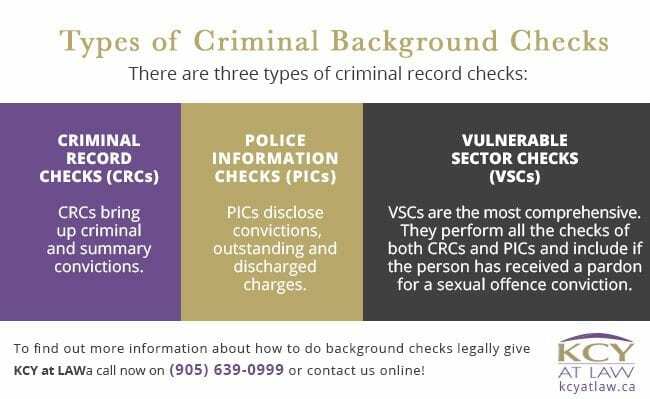 Criminal background checks are reasonable for employees who will be working in positions of trust or dealing with vulnerable populations such as the young, old or disabled. Since criminal background checks can easily bump up against human rights law and privacy issues, it is best that employers demonstrate that there is a bona fide occupational requirement for conducting one. Employers must receive written consent from their prospective employee before performing any sort of criminal background check. If you need to perform criminal background checks on prospective employees, it is imperative that you do not single out any particular candidate for said check. Doing so would be discriminatory and therefore illegal. Additionally, you cannot discriminate against someone who has been convicted of an offence unless you can demonstrate that this offence will directly impact their ability to perform the job. Checking a candidate’s public social media accounts for information that might help you make a hiring decision (i.e. their credentials and social judgement) is permissible under Canadian law. Checking a candidate’s public social media accounts can be done at any time during the hiring process – within limits. For an in-depth look at social media and hiring you can check out our blog on just that where we talk about social media and hiring practices. If you are in the process of hiring the perfect employee to join your team and are considering performing background checks, speak with an experienced employment lawyer to protect yourself from legal action. 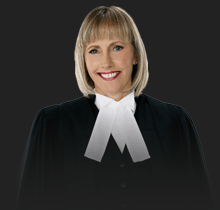 Contact KCY at LAW at (905) 639-0999 or reach us online here.